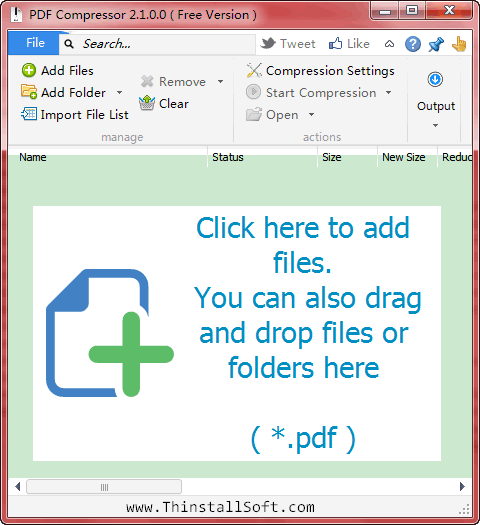 PDF Compressor is a newly free PDF utility to compress PDF files lossless. That is PDF Compressor will shrink PDF files, reduce the size of PDF files noticeably without any quality loss. PDF Compressor could batch compress thousands of PDF files. You should enter Compression Settings and enable the "Better Compress with minor quality loss". You should check the [Better Compression with minor quality loss] option in the Compression Settings. Note: Run PDFCompressor.exe to launch PDF Compressor Portable. PDF Compressor Portable was updated to version 2.7 on 2013/2/16. Thanks Rudy for the feedback. * Support batch mode. Easily compress thousands of PDF files. * Lossless compression, keep quality the same. * Better compression mode with minor quality loss. * The UI is intuitive and streamlined. * Easy to use, no learning curve. * Supports touch mode. Ready for touchable pad/Microsoft Surface. What's new in PDF Compressor Portable 2.7? New version (2.7.0) fixed some bugs reported by users. If you have 2.6.0, there is no need to update. This entry was posted in Office & PDF and tagged compress pdf, pdf, pdf compressor, pdf resize, reduce pdf, shrink pdf. Bookmark the permalink.